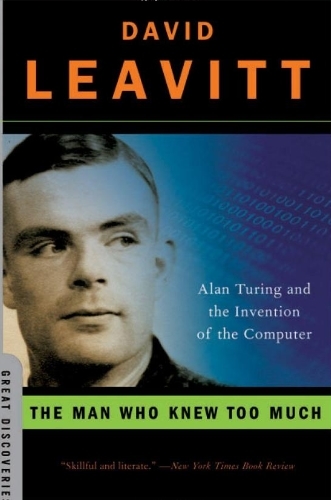 "The man who knew too much", Alan Turing and the invention of the computer, by David Leavitt. A well-researched account of the life and accomplishments, and, alas, the pain and sorrow of one of the greatest practical thinkers of recent history. It can be argued that Alan Turing was an aberration. Where others are reasonably balanced to cope with both the social and practical requirements of life, Alan Turing had little to no social abilities but on the other hand was a prodigious thinker cranking out solutions for problems. He is known as the man who cracked the German secret codes during WWII, a contribution to an early and victorious end of the war that can hardly be overestimated. He laid the foundation for modern computer theory - and practice, building vacuum-tube-based monsters that had the absolute novelty of a stored program, that could be altered for the task at hand. But he almost never saw his projects through; once the initial problems were solved, and the building well on the way, he was already losing interest and engaging in the next project.